It’s common knowledge that children learn by doing. Research on teacher effectiveness clearly supports this premise. The challenge for teachers is to involve all of their students most of the time in activities that are appropriate for their varying skill levels. Appropriate on-task behavior is often described as students behaving positively in a way that is consistent with the goals of the educational setting (Siedentop & Tannehill, 2000). A class of students who are on task most of the lesson contributes to a positive learning environment and is unlikely to present discipline problems. Deciding on the management protocols to use in your classes is relatively easy. The challenging part is teaching those protocols until students know them and they become a part of every class you teach over the entire year. Expanded to address teaching across elementary, middle, and high school, this resource focuses on what it takes to become a master physical education teacher. It includes new research, examples, technology tips, sample task sheets, and assessment examples—all relevant to K-12. It’s never been more challenging to teach physical education to children and adolescents. Between managing difficult behavior and adapting lessons for students with diverse needs, teachers have their hands full. Teaching Children and Adolescents Physical Education has been helping both new and experienced physical educators meet these challenges for many years, and this revised edition has been updated to address many of the new challenges that have emerged in the past decade. Expanded to address teaching across elementary, middle, and high school, this classic resource demonstrates the techniques and skills master teachers rely on. Many of these skills are illustrated with videotapes of actual K-12 teachers in action. This already-successful text goes beyond pedagogy to include concrete curriculum strategies for making classes vibrant, fun, and developmentally appropriate. Written in conversational language, the book is readily applicable. In addition, this resource features three new chapters that add even more depth to the topics covered. The chapters address long-term planning, writing, and teaching the lesson plan. The value of this book can be attributed to the authors’ years of experience teaching physical education in elementary, middle, and high school. George Graham, Eloise Elliott, and Steve Palmer understand all aspects of quality physical education and the teaching challenges that come with the territory—because they have been there. Emphasizing real-world strategies, the authors weave instructional scenarios throughout the book. Readers will see in action the decision-making process master teachers go through when writing and teaching lesson plans. Because every class is different, this resource also highlights how to plan for diverse students and how to adjust lessons accordingly. The text is packed with tried-and-true advice for motivating students to practice, building positive feelings, observing and analyzing, providing feedback, and assessing students through formative assessment. Examples show what effective physical education instruction really looks like in secondary gymnasiums and on playgrounds. Rich with firsthand advice and insight, this book will guide educators toward becoming master teachers of physical education. Why Do Students Act Out? Direct or Indirect Approach: Which Is Best? What Type of Teacher Will You Become? Textbook for elementary education majors and undergraduates in PETE programs. Reference for K-12 PE teachers. George Graham, PhD, is an award-winning university professor and public school physical education instructor who was named to the NASPE Hall of Fame in 2007. He is the author of Children Moving, currently in its ninth edition and used in more than 250 universities throughout the United States. Graham has spoken on the topic of positive physical education on CBS This Morning, CNN, and National Public Radio. He also has been cited in USA Today, the Harvard Review, and the Washington Post. Eloise Elliott, PhD, is a Ware Distinguished Professor at West Virginia University, where she leads initiatives to improve the physical activity participation of children. She has developed and taught university physical education teaching courses and conducted teacher training. She developed and oversees a web-based resource to help teachers include physical activity in the pre-K-8 classroom. A former public school physical education teacher, Elliott was appointed to the national President’s Council on Fitness, Sports and Nutrition Science Board. Steve Palmer, PhD, is associate dean at Northern Arizona University (NAU) in Flagstaff. His background includes 15 years in physical education teacher education and research. He also has taught elementary and middle school physical education. Palmer leads and coordinates NAU’s physical education teacher education program. He has published numerous papers related to physical education curriculum and teaching. The web resource includes new video and retains the classic video clips of real-world physical educators from previous editions directed to the full K-12 spectrum that demonstrate teaching techniques described in the book. In total there are 100 clips. The web resource includes blank versions of worksheets that students can download and use in classes or labs. The instructor guide includes outlines, summaries, reflection questions, and additional learning activities for each chapter, as well as microteaching lessons and sample course syllabi. Files are provided in DOC and PDF formats. The test package includes 171 fill-in-the-blank, short answer, and multiple-choice questions. Users can download it as Respondus or RTF files, or as files formatted for LMS use. 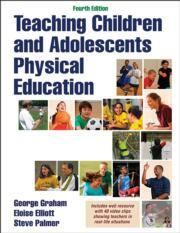 Teaching Children and Adolescents Physical Education enhanced e-book editions available!